With all the controversy and market disturbance of the Optoma UHD65 (the first 4K UHD projector under $2,500) we were anxious to get our hands on the laser version with its claimed higher contrast, wider color gamut, and significantly brighter light output. Even though some of us were able to see the UHZ65 at Infocomm 2017 and CEDIA 2017, it is almost impossible to make any real quality assessment at a trade show particularly in high ambient light conditions which these projectors are not designed for. During CEDIA we were fortunate enough to talk to the national sales manager and, with the help of our rep, we were able to have one for two days for our annual Fall Open House. Please understand that up until this projector was announced, 4K laser projectors have a cost upwards of over $25,000 and even the Epson 1080p laser with “4K Enhancement” (1/2 UHD pixels) costs about $8,000. That is not to say that the UHZ65 is in the same league as those projectors as far as features go. But as far as image quality goes I think it will surprise many how good it is. Note that we did run into an anomaly with the video recording with color accuracy, the timing of the camera shutter speed and the sequential color nature of single chip DLP projectors somehow effected the the accuracy of the colors (mainly the blue) in the video version of this comparison (but not the stills in this article post). Despite trying several different shutter speeds and checking two different monitors (one looked OK the other had the purple) we had to go with what we got that night as the unit would have to be flown out the next day. Once we get our own UHZ65 we will track down the unique circumstances of the camera turning deep blues into purple. So, for the color portion of the comparison please refer to these images as they reflect more what our eyes see. For contrast and detail please refer to both as there are some scenes that are better in the video and some that are better here. Weight: 31 lbs. 20.5 lbs. This is what we were most interested to see due to the laser light source. Laser light source has the capability (depending on the design) of producing a wider color gamut with deeper colors more closely approximating what our eyes see in real life. The Sony features what they refer to as “Triluminos” color which is very good compared to most projectors. The Epson LS10500 laser projector has one of the best color gamuts we have tested and comes very close or even matches (with the color filter engaged in the “Digital Cinema mode”) the DCI P3 current motion picture standards. So, how good is the UHZ65 color? We started with an abbreviated calibration (time limited) and started the comparisons. The UHZ65 laser comes very close and slightly exceeds some of the VPL-VW365ES color saturation and color brightness. Blues, greens, and yellows of the UHZ65 have been incrementally improved in this laser version from Optoma. One of the dramatic improvements in the UHZ65 over the UHD65 is the light output. 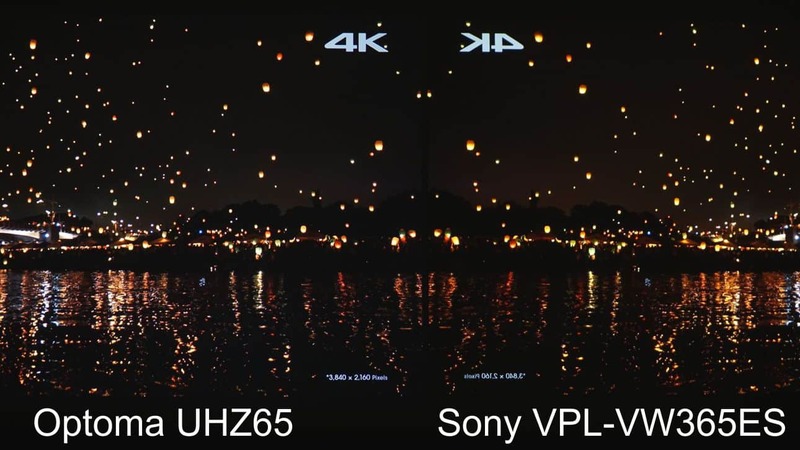 When we previously compared the UHD65 to the VPL-VW365ES, in order to make the comparison even close, we had to put the UHD65 in its brightest lamp mode and the Sony in its lowest lamp mode. Not this time. The UHZ65 easily equals the brightest mode and can even go higher in some modes. We did not have time to calibrate in this first test. The other thing that is very different with the UHZ65 is that in the brightest color mode (not yet tested by us) it did not yield a greenish image like the UHD65 and 60 do. So potentially this new Optoma could be calibrated in its brightest color mode and potentially reach over 1,500- 1800 lumens with D65 calibration (manufacturer brightness ratings are not with calibrated D65 color accuracy) . Stay tuned. In the mean time, this next image shows how bright the whites are in this image of a child. Notice the bright white window behind his face on both sides of the image and how the Optoma is clearly brighter and in fact measured 10 foot candles higher. The skin tone, however, is slightly darker but mostly just different than the Sony skin tone in this shot, both looked amazing. Comparison of skin tones and brightness. Both were very impressive in these high brightness modes. This next image really surprised us. The yellows were always a great strength of Sony projectors and yet in this image the laser has greatly improved the Optoma yellows. Whereas the UHD65 had respectable yellows for a DLP projector, this laser version is outstanding. The yellows, greens and blue are very rich and saturated. Even against the Triluminos color of the Sony, the laser projector delivers compelling color – especially in this price range. This got really interesting for us. Even though the deep blacks were not visibly improved over the UHD65, the overall contrast was. Why? First, because you are dealing with a much higher light output and essentially the same black levels, the contrast naturally increases. Second, this like its little brother, the laser version features the “Pure Contrast Engine,” which is a form of dynamic light control. It does amazing things for the image. With this circuit engaged it comes close or exceeds many more expensive projectors with normal brightness level and near black images. In the case of the VPL-VW365ES compared here, it really depends on the scene. In this next shot we did find a single image which shows how each projector had better contrast in different areas of the image. The areas in the green circles in the Optoma image clearly had better contrast, while the blue areas highlighted on the Sony image had better contrast in the darker areas. Look closely and you will see why this is so interesting to us. Note: Right image is flipped left to right for better comparison. When it comes to absolute black levels in a predominately black scene, like the one below, there is no question that the Sony has the advantage in blacks. However, it is interesting to note that even in these very dark scenes the Optoma has the much brighter highlights as can be seen with the brighter stars and higher contrast overall. We suspect this is because of the higher native contrast of the DLP imaging chip or perhaps the higher depth of modulation around the two pixel resolution like most of the stars in this scene. In either case it is very noticeable and which is better is a matter of personal preference. has the deeper blacks in the dark voids of space. noticeable except for the brighter stars on the Optoma. total level of a scene increases in total luminance. This is where all the internet chatter seems to focus. On the one hand, the Sony has three “true 4K native” imaging chips, whereas the Optoma uses a single Texas Instruments 4K UHD DLP chip. The controversy and confusion is that many feel the TI chip is using a similar “e shift” or “4K enhancement” method, like some other manufacturers use, based on a 1080 chip set; Optoma is not. It is a higher resolution imaging chip (smaller pixels) and uses an “optical actuator” to deliver a full 8.3 million pixels to the screen. Is it perfect? Of course not, but it is very close and in some cases better than some “true 4K” projectors to the eye because it does not have to deal with the ultra fine and very critical alignment of three separate imaging chips at a resolution of 4K. You can debate and argue all you want but please – see for yourself a side by side, and then you make the call. in the blue circles shows higher detail. Click to see higher res image. For us, it is more about the end result rather than how (although that is always interesting) it is accomplished. We have yet to read a review or do a demo to a potential client where the detail or resolution of the Optoma is in question, it is quite simply very very good for its price. shows how close they really are when it comes to overall detail. Higher magnification of a super detailed 4K image. 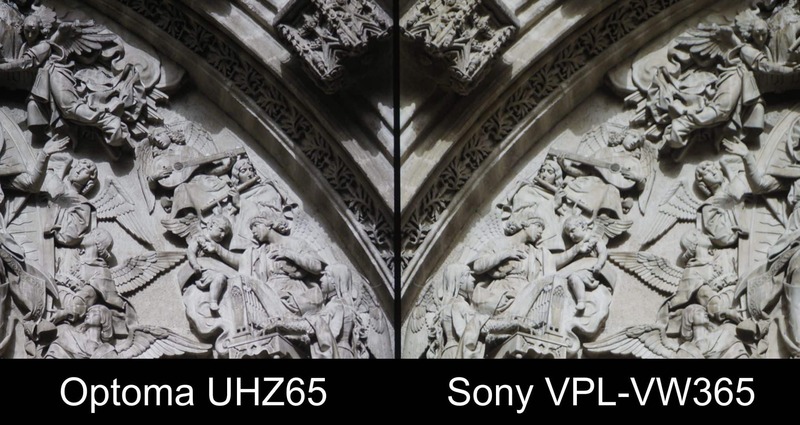 The Optoma UHZ65 does indeed deliver a brighter, wider color, and improved contrast image over its little brother, the UHD65, and comes very close to the Sony VPL-VW365ES. Which one is best will depend on your budget, application, and usage. The Sony has the feature advantage of 3D, lower latency for gaming, and full lens shift horizontally and vertically. The Optoma has a no-lamp design with a long life (20,000 hrs to half brightness) laser, excellent detail, color, and contrast. How close the newly announced VPL-VW285ES comes to either of these will be the next question. 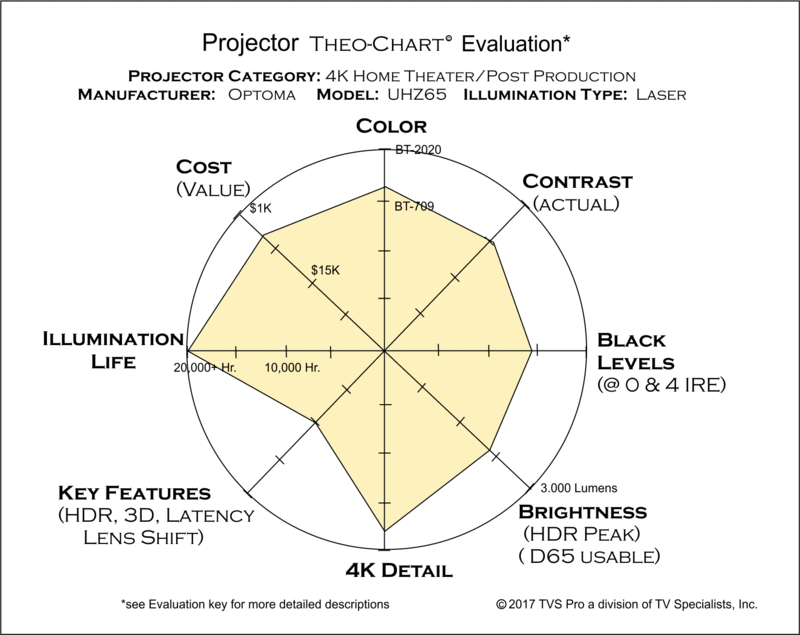 Below are the Theo-Charts of both the projectors compared above. 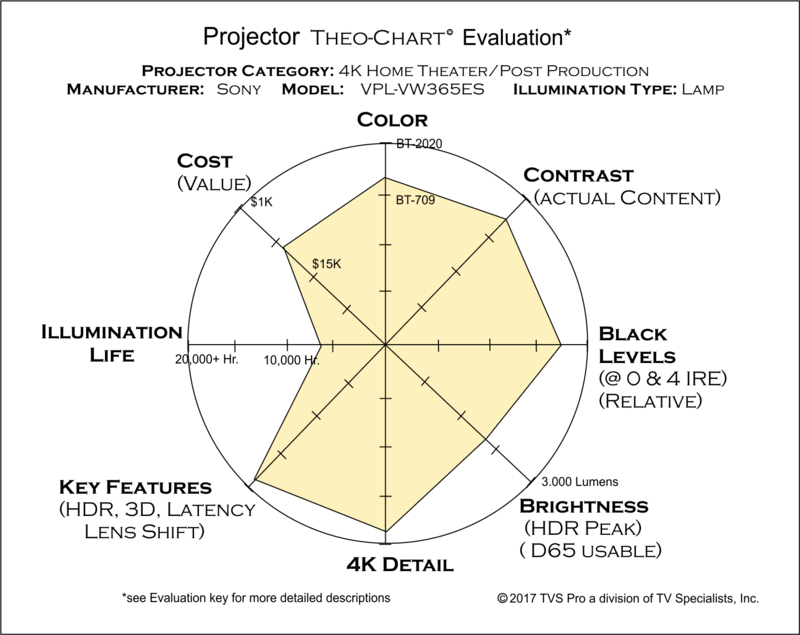 To see additional projector Theo-charts and how they compare simply hover over “Home Theater” from the main menu and select “Home Theater Displays” and then click on “Projector Comparison Charts”. Note: brightness above was in “reference” color mode, 100% laser light setting. Sony brightness above was in “CinemaFilm2” color mode, high lamp setting. This entry was posted in AV Solutions, Home Theater and tagged 4k, 4k projector, home theater projector, laser projector, Optoma, optoma 4k projector, optoma laser projector, Optoma Projector, optoma uhz65, Sony, sonyy vpl-vw365es, SXRD projector, true 4k, true 4k projector, UHD, uhz65, VPL-VW365ES. Probably not, but we can get you an incredible deal on our like-new LS10500, probably under $4.5k. It’s a great projector as long as you have a screen under 120″ with the filter out or under 105″ with filter. Hello again Ted: I’m looking forward to a more comprehensive review of the UHZ65 by you. In the meantime, I’d like your opinion on an aspect of measurement of lumen output I recently discovered: I learned of a method (which has actually been around since 2012) by which a projector’s white lumen output and its color lumen output are measured and two separate numbers, one for white lumens and one for color lumens are provided. Now as you know, most projector manufacturers, with the exception of Epson it seems, provide only a single lumen number and that lumen number, in the absence of a color lumen number, refers to white. White lumens are of course important and if a measurement of 1000 lumens is obtained at a particular point on the screen for white that’s fine and good, but it really doesn’t say anything about the color lumen output. I’ve always wondered why many projectors I’ve seen have good lumen output – which refers to white only – and have washed out or dull colors even after calibration. Light behaves differently with different colors so it would make sense to determine the color lumen number as well as the standard ansi lumen which refers to white only. As an example, if you go to the Epson website and look at their specs for projectors, they provide two lumen numbers, one for white and one for color – and they are often the same. Measuring white lumen output is very easier compared to the process and setup required to measure color lumen output, so I suspect that’s the primary one never sees it in reviews, it takes too long and you need a special setup. But the manufacture certainly knows their color lumen numbers for their projectors but do not publish them – with the exception of Epson – usually because their color lumen numbers are lower than their white lumen numbers for a given projector. In any case, I’m curious if you have any opinion on this aspect of projector lumen measurement? Peter, you are correct, there is a big difference in many projectors between their white light output and their color light output. In fact, there is a whole website dedicated to it, its at http://www.colorlightoutput.com and it lets you look up many current and past projectors which have been tested by an independent lab and they post the reslults. Color light output can tell you the brightness of its color reproduction but not the gamut or color space and accuracy of the color. Without going into too much history you will notice that most professional LCD projectors (3 chip) Such as Sony and Epson do publish their color light output. (mostly professional projectors) Because their projectors are based on RGB imagers their color light output will always be the same as their white light output. The projectors which do not have high color light output are single DLP projectors. The reason is that the color is sequential in nature and many professional DLP projectors and some consumer ones as well have a clear section in their color wheel which helps to boost their white light lumens rating but it does so at the cost of color accuracy and color brightness. Higher color quality single DLP projectors eliminate the clear or “white” section of the wheel and sacrifice white lumen ratings for higher color quality. The reason the single DLP manufactures do not publish their color lumens is that in many single DLP projectors the color brightness in less than 1/2 of the white light output. In many cases the color output is only 1/3 of the white light ratings, hence they do not publish it. 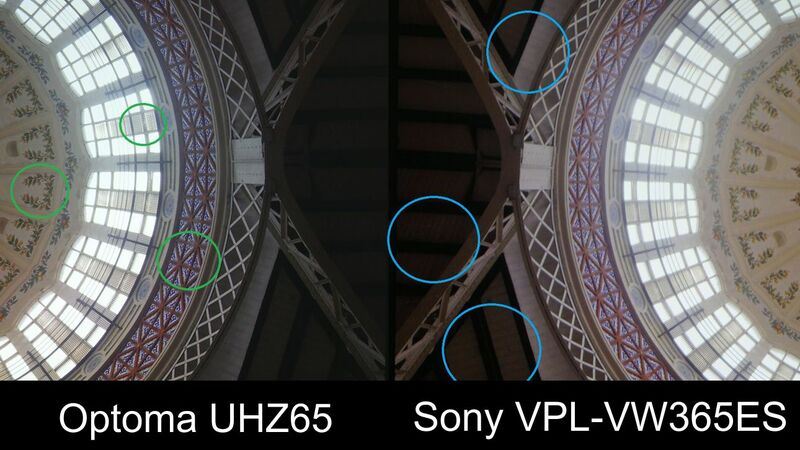 We have found that RGB/RGB color wheels like in the UHD65 and UHZ65 (in this case the laser is the blue) are much improved color brightness and can reach as high as 80 to 90% of the white output and can look as good or better than some 3 chip sytems depending on the color filters and contrast of the given system. It is the new 4K imager and the use of a RGB/RGB (six segments all primary colors) that prompted us to see how it compared to a native 4K 3 chip system. As you know now, as they say, the rest is history, this combination is really shaking up the 4K home theater world. Peter, If you do a little research you will see the UHZ65 does use pixel shift. from their data sheet “4K UHD 3840×2160 @ 60Hz with XPR Technology” look up the xpr technology, even on their user manual page 56 it states “Native resolution (w/o actuator) 2716 x 1528” somehow they bounce the image 2 times off a single mirror to get to 3840×2160. I am sure it looks great but they should not be allowed to say true 4k when it is not. 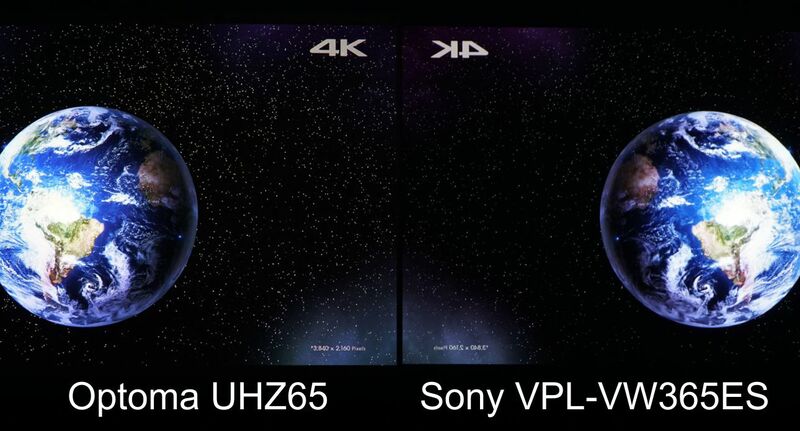 I love your reviews, i do have a question about true 4k and lens shift on the uhz65, you claim it does not use lens shift to get 4k but the data sheet from optoma state “4K UHD 3840×2160 @ 60Hz with XPR Technology” isn’t that xpr technology lens shift ment to achieve 4k from a 1080p source? Please help me understand. Great question, yes, this is very different than the “e shift” that JVC and Epson use. They both start with a 2 million pixel chips and then electronically shift the pixels to end up with a 4 million pixels display. The XPR DLP chip uses a “optical actuator” which physically move the 4 million pixel chip to actually deliver over 8 million pixels that are addressable. Our purpose was to see how it compared to “native” 8 million pixel displays and it surprised us and had now surprised almost every person who has reviewed or seen a side by side. Under $4,500 for a laser 4K puts this in a whole new category of price and performance. I have to admit it looks really amazing to me from your video. Thanks Ted for your reply and comments: In spite of the brightness issues and slightly better blacks on the Sony which are not always obvious because it depends on the scene, I felt the UHZ65 still produced a more color-accurate image and felt the Sony had a somewhat orange hue to many of the images I saw. Of course, calibration can play a role so perhaps the Sony needed some attention in that area. In any case, I’m using a Panasonic AE4000U (2009) and think it puts out a staggering image, but it doesn’t handle 4K, and I’d like to get away from a lamp-based projector. I am in a state of anxiety as to whether to go with the UHZ65 (or some other laser-based projector). Would be great to see a comparison review of the Epson 5040UB and UHZ65 even though the Epson is lamp-based and uses pixel-shifting. And until I found your site I was waiting for projectorcentral to come out with their assessment of it, but still nothing from them. So it’s great to see your very informative review of the UHZ65 (and by the way I signed up at your site). 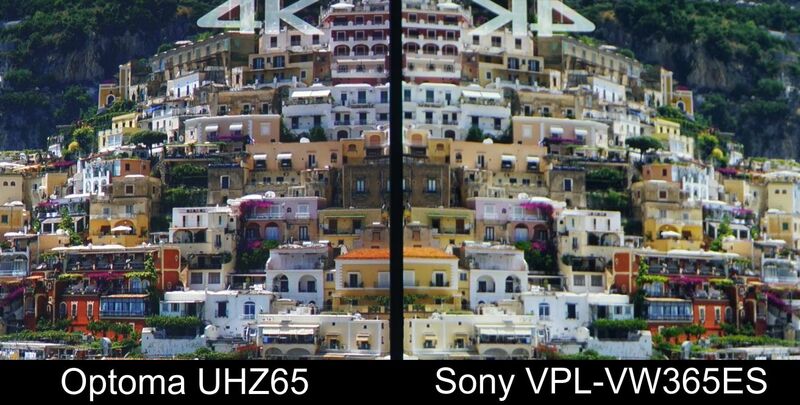 However, I think I just might pull the trigger on the UHZ65 and pair it with an OPPO UDP-205 player – both the OPPO and UHZ65 can handle a 4:4:4: 10-bit color space and support HDR10. I can’t imagine the results being less than extremely good if not stellar (and I would have to presume it would be clearly better than my current Panasonic AE4000U at least for standard Blu-ray). I’d be happy to hear any thoughts you might have on such a pairing . In any case, looking forward to your other reviews as they come online. 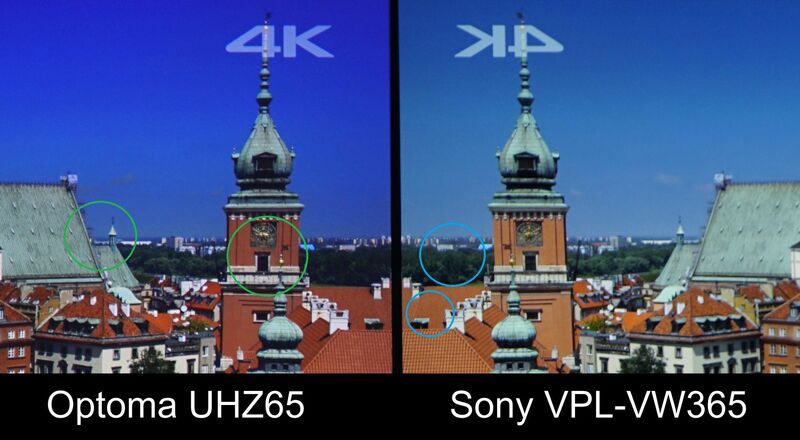 Very keen observation, yes we do know why the Sony appears brighter in some scenes and the Optoma in other. Two things are going on, one is color brightness and the other is their dynamic black circuit. 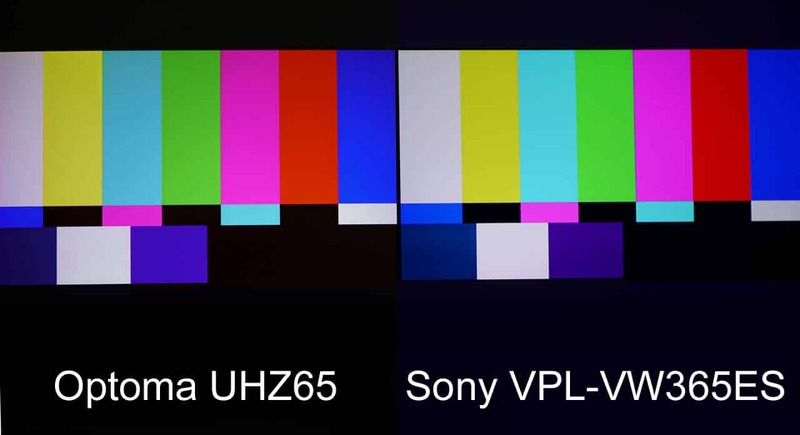 Since we were so rushed in this UHZ comparison we will be getting our own UHZ65 shortly and will also calibrate and check in the bright (not green like the UHD65 & 60) and Vivid modes. As close as they were in their calibrated reference cinema modes we suspect the UHZ65 may have a lot more to give. You will notice when I measured the light output I was comparing white light only (the standard used for rating projectors) however if we had measured color light output it would have been possibly less in reference mode, stay tuned, and we appreciate your interest and detailed observations. We will get to the bottom of the mysterious purple blue camera pick up, it could have something to do with an IR cut filter as well, it was a EOS cinema C300. The camera man now tells me he could adjust the shutter speed and reduce or eliminate the purple but then the Sony flickered so he stayed with the first setting. Interesting review of the UHZ65 and the Sony 365ES: I watched your video using a Philips 24″ IPS color calibrated monitor: Perhaps you’re aware of this: You began with a lumen measurement and said the Optoma was brighter; When watching your comparison video, when you showed still shot comparisons the 365ES shows up as brighter than the UHZ65 (not to mention that it has a slight orange tint to certain scenes) . However, after seeing the same still images via this website, it’s clear that the Optoma IS, in fact, brighter. Without trying to figure out why these comparisons wound up the way they did, i.e. in spite of the reading saying the Optoma puts out more lumens, the brighter projector seems to be the Sony, while for the website same images that appear in the video, it’s clear the Optoma is brigher, I’d have to say you should figure out why the discrepency exists and correct it. Otherwise, it was a very interesting and informative video. Thank you.